Lamb tends to be expensive, so whenever I see it on sale at the market or grocery store, I grab it. That’s exactly what happened with this rack of lamb. 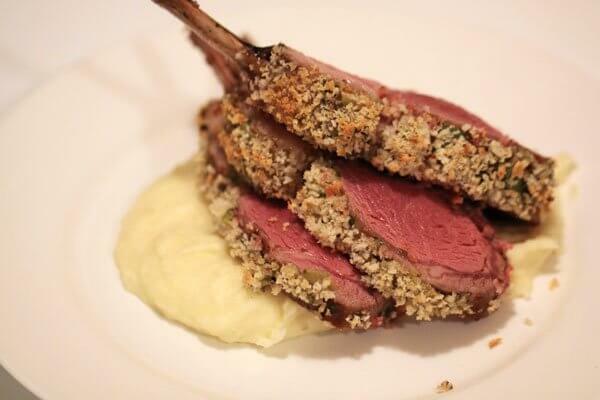 Rack of lamb is an expensive cut, but when prepared properly, you understand why. It’s very tender and full of flavour. This breadcrumb coating is a pretty typical preparation. After browning the meat in a frying pan, it’s coated with a mixture of mayonnaise, olives and herbs. It’s then coated with fresh breadcrumbs (I used panko crumbs instead), and roasted until perfectly medium-rare. Delicious on a bed of silky mashed potatoes.